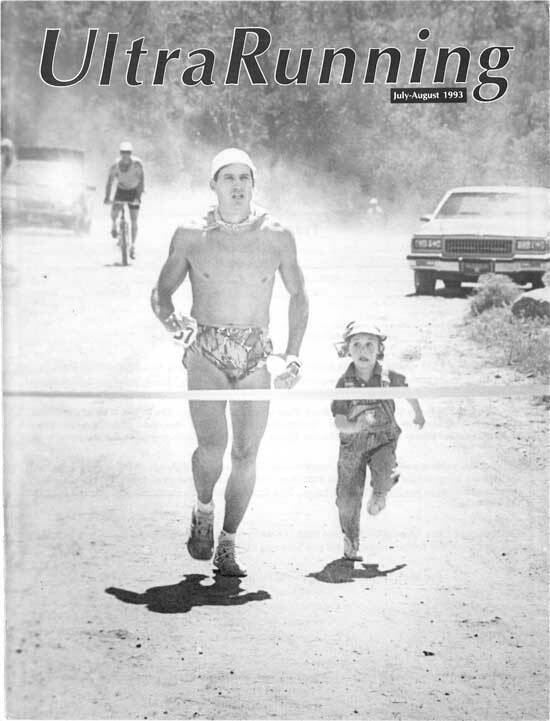 This article originally appeared in the July/August 1993 issue of UltraRunning Magazine. Want to view more articles from the archive? Check out our preview of the complete magazine archive. David Horton has been running ultras for 14 years, with outstanding performances at a wide variety of distances, including a 52-day record for the Appalachian Trail. More relevant for this article, his coaching has inspired many runners in his hometown of Lynchburg, Virginia, to give a 50-miler a try. He is also the race director of the Mountain Masochist Trail Run, a 50-miler that pays particular attention to the needs of the first-time ultrarunner. As youths we have visions of grandeur. We see ourselves accomplishing great goals and becoming outstanding athletes. We watch the Olympics and other sporting events and visualize ourselves standing on the podium receiving the accolades of our peers and the public. We see the agony and the ecstasy on the “Wide World of Sports” and dream of achieving the thrill of victory. Somehow, time slips away, and before you know it you’re married, have kids, a job, a house payment, and those childhood dreams are just that… dreams. You don’t have the time or desire to train, or you don’t see becoming an athlete (if you’re over 25-30 years of age) as a real possibility. I grew up like many of you did — playing team sports (basketball and football). In college I played a little basketball and ran one season of track and cross country. In the next several years, I got married, had two kids, exercised sporadically, gained 15-20 pounds, and eventually went back to graduate school. The Next Challenge. I purchased a copy from him and read it thoroughly. On November 19,1979, I completed the JFK 50 Mile in 7:43, placing 24th out of 405 starters. Since then I’ve completed over 70 ultras, winning many of them. Still to this day, the most rewarding, enjoyable, exciting, and fulfilling moment of my athletic career was crossing that finish line that day. I wish I could put into words the feelings I had. Americans receiving gold medals at the Olympics couldn’t have felt any prouder than I did that day. (1) What makes you think you can complete an ultra? You, too, can experience those feelings by completing your first ultra. Ninety-nine percent of all runners will never attempt an ultra because they perceive it as something too difficult and unattainable. If you’re in that boat, I would suggest that you go work an aid station at an ultra, crew for a runner, or just go to the finish line. As the race director of the Mountain Masochist 50-miler, the part that I enjoy the most is watching people complete their first ultra. The enjoyment and excitement that they exhibit makes all the effort that goes into putting on an ultra worthwhile. You sec pain, fatigue, and broken bodies, but you also see people of all shapes and ages becoming a kid again and realizing their dreams. Many of the people you will see finishing are ordinary people doing extraordinary things. Completing an ultra is within the reach of nearly anyone who has the desire, discipline, and dedication to work hard over a period of time in training, and in the race. (2) How to pick your first ultra. Technically, any distance beyond a marathon (26.2 mi) is considered an ultra. However, the usual starting distance for ultras is 50 km (31 miles). Most ultrarunners (me included) consider that (real) ultras are 50 miles or longer. Find a fall 50-milc that is point-to-point if possible. The fall is better than the spring. In the fall the weather will either be hot or cold or just right, all of which your body can handle. In the spring it could be hotter than your body is acclimated for. A point-to-point race is better psychologically because you feel like you’re getting somewhere. If the race is comprised of two, maybe three loops, it is not too bad. When you start having more than two loops, it gets very tempting to stop when you get back to the start/ finish area. Also, pick a well-established race that has lots of aid stations and usually a large number of runners. If it is well-established, you don’t have to worry as much about course markings and whether or not the aid stations will be set up and adequately stocked. The minimum number of aid stations that I consider necessary is one every five miles. Some races do not have this many because of inaccessibility. With ten or more aid stations, runners do not have to be as concerned about carrying aid with them. You also have to decide whether to run a road or trail 50. In the early 80s, road 50s were very popular, but now trail 50s are more popular. I think a trail 50 is a better choice for your first ultra. Trails are easier on the body and mind. If you do one on the road, you have a greater tendency to run too fast and you will definitely feel the pounding of the asphalt. (3) Training for your first ultra. Most people would assume that the normal progression would be five km, ten km, ten miles, marathons, and then a 50-milc. I think that is appropriate in most cases. However, I don’t think you necessarily have to run a marathon before you run an ultra. For that matter, I know of a couple of runners whose first race of any distance was an ultra. However, most runners won’t attempt an ultra after having finished a marathon or two. The thought of going almost twice as far, hurting twice as much, and training twice as hard, is just an unbearable thought. You don’t hurt twice as much. In fact, ultras are easier than marathons. Marathons arc much more intense and most people run the entire distance. In ultras only the very elite arc able to run 50 miles non-stop. And some elite runners, who run all the way, are still beaten by other runners who mix in walking with their running. The longer you’ve been running the better will your chances be of finishing your first ultra. I don’t know the minimum time that you should have been running before you attempt your first ultra, but I would suggest at least six months or more. After picking out your first ultra, try to allow three months of gradually increasing your mileage to a peak of 40-50 miles per week the last two to three weeks before race day. You should run six days a week, taking off the day after your long run. The day before your long run should be very easy. What constitutes a long run? If your daily average is four to six miles, then a long run would be ten to 12 miles. If you normally run six to eight miles per day, then a long run would be 12-16 miles. Eventually the goal should be to complete two to three runs of 20-25 miles. Do I have to run all the way in my long runs? No. In fact, one problem that many first-time ultrarunners encounter is that they have difficulty with the amount of walking that must be done in their first ultra. They have trained to run but not walk. I would suggest that you mix in some walking in your long training runs. Walk up some of the short steep hills or run a specific amount ol lime and then walk a specific amount of time. In my first several ultras, I would run 25 minutes and walk five minutes until I got tired; then I would change to 20 and five, and later 15 and five. If you’re training on trails or on hilly roads, you can just walk the uphills and run everything else. The key principle for any runner is specificity. Your training should mimic as closely as possible the racing terrain and conditions. If you’re going to be doing an ultra on trails then your long run should be on trails. If you are going to race at altitude or your race includes long climbs and descents, then you need to prepare for those variables if possible. Do I have to run on trails every day if I’m going to race on trails? No. I usually do only my long run on trails. Occasionally I will do two training runs on trails in one week. I also think that you should do one medium long per week — usually on the road at a good pace (as fast or faster than your normal daily pace). A relatively easy day should follow and precede this day as well. Your goal in your first ultra should be to finish. Try not to think about any particular time or person you want to beat or keep up with. How long will it take me to finish 50 miles? When I first started running ultras I was told to multiply my marathon time by two and add two hours. Thus a three and one-half marathoner should be able to finish a 50-mile in nine hours. I think this is fairly accurate for road 50s but not trail 50s. A better gauge for trail 50s is to multiply your marathon time by three. (4) Equipment for your first ultra. The most important piece of equipment for any runner is shoes. I don’t think the shoes that are specifically designed for trails are better than the typical running shoe. If you are going to run on trails you need to have shoes that possess adequate stability, traction, and durability. I wear Nike Air Pegasus for road and trail races. I think it is the best cheapest shoe for any running. You should also invest in some type of fanny pack in which you can carry food, first aid supplies, fluids, and many other items. I use the standard pack from Angeles Pack Co. It has two 21-ounce bottles and pouch in between for supplies. The best feature that it has is the velcro fasteners. You can very quickly put it on or take it off and the velcro doesn’t slip. The hand-held bike bottle they have is also very functional for training and racing. Other companies such as Ultimate Direction also make good fanny packs. If you choose the correct 50 with adequate aid stations you shouldn’t have to carry a fanny pack; you can just get by with carrying a water bottle. You should also consider wearing some type of hat or cap and sunglasses to keep the sun out of your eyes. If it might be cold you should have a wool or polypropylene hood. If you’re sensitive to the cold, have cotton gloves; if it might be very cold and rainy, have some Gore-Tex or waterproof mittens. You should have some non-binding shorts that you have adequately tested in your long runs. While doing the Appalachian Trail in 1991, I found that wearing bike shorts under my running shorts totally eliminated any chafing problems. I’d always hated the way that these shorts looked on other runners and thought they were just for show. After my first three days on the A.T. I had rubbed the inner parts of my thighs raw. At the suggestion of Gary Buffington, I started wearing an old pair of his biking shorts. From then on I never had any problems with chafing as long as I wore the bike shorts (and I never had to use any Vaseline). I think the best type of top is by Patagonia made of lightweight capilene. I use a white short-sleeve capilene top and a red turtleneck long-sleeve shirt in cold weather. This material keeps you dry and warm in the winter, and cool and dry in the summer. Many runners wear tights in cold, cool, or rainy weather. I don’t recommend them, because they are very difficult to get on and off quickly and could result in your muscles cramping up when you’re taking them off. If it is going to be cold I wear nylon wind pants or Sporthill bottoms if I need more warmth. Over the top of all of this, you should have available some type of Gore-Tex jacket in case bad weather begins. The last few days before your first ultra can be unbelievably difficult. When you first started thinking and talking about the race three months ago, it seemed fun and exciting and “possible.” Reality sets in now and you’re not sure if you can make it 20 miles much less 50 miles. It now seems like an “impossible” task. Have no fear, this is common to nearly every ultrarunner — even experienced and highly successful ultrarunners. Your last hard workout should be one week before the race. In a typical week before a big race I will run eight on Monday, six on Tuesday, and four on Wednesday and Thursday, and take Friday off if the race is on Saturday. Just remember that it is better to do too little than too much during the race week. You can only hurt yourself if you do much running during race week. More training won’t get you in better shape; it will just make you more tired on the day of the race. All of these runs should also be at a very relaxed pace (don’t time them). On Tuesday, Wednesday, and Thursday nights you should try to get plenty of sleep. Typically the night before a race you will not sleep very well. If you didn’t get any sleep at all it probably wouldn’t affect your performance as long as you had slept well the last three or four nights. Beginning on Wednesday you should try to concentrate on eating primarily carbohydrates at all of your meals. Don’t make a mistake of eating too much, especially on Friday night. If you overeat you’ll just have to make extra “pit stops” to fertilize the forest on race day. On Friday, you should also try to get well hydrated. How can you tell when you are well hydrated? When you have to go to the bathroom frequently and your urine is clear, then you are well hydrated. To hold yourself accountable before your first ultra, you should announce to everyone that you know what you are going to do. Also, I think it is a good idea to set down and write out all the reasons why you are going to finish. Many times in ultras you will come to the point where you wonder why you should continue on. Think back to that list you made out and recite the reasons why you should finish. If you do have a crew you should make sure that you have a wide variety of food items available. Should you eat during an ultra? Maybe. If an ultra is six to seven hours or less, I primarily consume liquids. If it is longer than that I will eat some solid foods. What kinds of fluids should I have? You should have water, some type of replacement drink, and some type of carbonated beverages. All of these should be cold because cold fluids empty from the stomach quicker than warm fluids. You should experiment with different replacement drinks in your long runs to sec if you can continue to drink them over a period of time. Many of these drinks taste good initially, but after six to seven hours they make you nauseous. Personally, I think Conquest is the best replacement drink there is. When I did the Appalachian Trail (2,144 mi) in 1991, I drank over one and one-half gallons of Conquest every day for 52 straight days. I never got tired of it and it worked wonderfully for me. In terms of carbonated beverages, I use either Pepsi or Mountain Dew. Mountain Dew might be best because it has more caffeine than any other carbonated beverage with the exception of Jolt Cola. There is no real secret in terms of what to eat. Nothing seems to taste good or sound appealing after a period of time. The best thing to do is to have a wide variety of items such as chocolate chip cookies, crackers, candy bars, turkey and cheese sandwiches, soup, fruit such as watermelon, honeydew, or cantaloupe, mints, and PowerBars. I primarily eat Skor candy bars, chocolate chip cookies, and potato chips. You should practice consuming these items in training to see what works best for you. (6) The race — your dream day arrives! This is the day you trained for and thought about for so long. This can be the most rewarding day in your running career. When you go to bed on Friday night you should set two alarm clocks. This increases the likelihood that you will sleep better. With only one alarm there is always the thought that you will oversleep and with that thought in your mind, there is no way that you will sleep soundly. You should get up at least one to two hours prior to the start of the race. Allow plenty of time to dress, eat, have a great bowel movement, and get to the starting area of the race at least 30 minutes or more prior to the start. What should the breakfast include? The breakfast should be something light and easily digestible such as cereal, pancakes, waffles, pastries, milk, juice, or coffee. Personally, I usually eat a single waffle or two to three small pancakes and drink a cup or two of coffee and a glass of milk. Between breakfast and the start of the race I carry around a hand-held water bottle and drink continually — trying to get super-hydrated. When the runners line up for the start of the race, get near the back of the pack. Do not get near the front; if you do you’ll pay dearly sooner or later. You will start out too fast even though it feels very easy. How fast do I run and how do you mentally comprehend covering 50 miles? Tom Osier said that you should divide the race into thirds. He said you shouldn’t feel the first third, that it should feel like a walk in the park. The second third should still feel relatively easy with a moderate amount of discomfort. The last third is where the real race begins. This is where you must grit your teeth and concentrate your mental energies on finishing. In terms of pace, think about your projected finishing time. If you plan on finishing in 12 hours, your starting time of 6:30 a.m. will have you finishing at 6:30 p.m. As you run, you have to keep in mind that you have to pace yourself so that you can still be running and walking at three, four, five and six o’clock. This helps put a damper on your enthusiasm and pace in the early stages of the race. Overall, your running pace should be slightly slower than your normal running pace. When you walk, it should be very brisk — something that you’ve worked on in training. When should you start walking in the race? If you wait until you feel like you need to walk, you’ve waited too long. You should start walking from the start — when you hit your first hill. This can be very hard to do. I know from experience. In the JFK 50 Mile there is a climb of several hundred feet up South Mountain from miles two to three. I’ve always mixed in some walking with running as I climbed the mountain. One year my son was waiting at the top to give me a water bottle. He asked me what was wrong because I was in about 40th place. I told him that nothing was wrong and that everyone else was going out too fast. I could have run all the way up the mountain, but I didn’t. I ended up in second place, 53 seconds behind the winner and set a masters course record which still stands. You should carry a bottle and drink fairly continuously throughout the race. Drink your replacement drink as much as possible. If you notice your stomach getting a little upset, switch to water for a little while. I usually don’t drink Mountain Dew or Pepsi until the later stages of the race, or when I feel weak or light-headed. Tom Osier originally drank tea that was sweetened with two pounds of sugar per gallon of tea. You should never get thirsty. You can lose one and one-half percent of your body weight before your thirst mechanism is activated. Significant decreases in performance can start occurring with a three percent loss of your body weight. In many ultras I actually gain weight during the race because I drink so much. I try to time my drinking and eating so that the majority of it occurs when I’m walking up a hill. For that reason, it is better for your crew to meet you at the foot of the hill/mountain rather than waiting for you at the top. How can you tell if you are drinking enough? As long as you continue to urinate and your urine is clear, you’re drinking enough. If you are urinating infrequently (or not at all) or your urine is yellow, you are not drinking enough. One day while I was doing the A.T. I urinated 21 times in 42 miles! If the weather is hot you should concentrate more on volume of fluid — maybe drink more water and dilute your replacement drink. If the weather is cold concentrate on drinking your replacement drink and possibly mixing it a little stronger. One of the most frequently asked questions is, “What do you think about?” You should be constantly monitory your body and decide if the pace is okay, are you drinking enough, are you walking enough. Before you arrive at an aid station be thinking about what you need. If you don’t pre-plan, you’ll waste time at the aid stations or with your crew trying to determine what you want. Also you should get in and out of the aid station as quickly as possible. Two or three minutes can pass by so quickly at an aid station. At the Mountain Masochist we have 16 aid stations. If you spent two minutes at every aid station, over one-half hour is gone with no forward progress. You will eventually get to a point in the race where your progress seems so slow (usually between 30 and 40 miles), despite your effort which seems so immense. You don’t hurt badly in any one place, just tired and weak and like a very old person with very little energy. What should you do? Keep eating and drinking as much as you can stand. More than likely you have low blood sugar or are dehydrated, or both. Even if you have to walk for an extended period of time, you’re still making progress, and a long walking break may bring you out of a deep pit. In 1980, I was running my first 100-mile, Old Dominion. Around 76 miles I became nauseous and threw up violently. After looking at my time I figured out that I could walk in from there and still break 24 hours. I walked from 76 to 90 miles. At 90 miles I began feeling better and started running again. From there in I made good progress, finishing in 21:45. Finally you will reach that point when you realize — “I will finish.” It is hard to say when that will occur; maybe 40-45 or 48 miles. When it does occur, your whole attitude will change as you realize you’re going to accomplish something that very few runners (much less people) will ever accomplish, finishing a 50 mile race — dream realized! (7) Recovery — what do I do now? The next day you should go out and walk 20-30 minutes or run very slowly for two to three miles, and then get in a whirlpool or take a hot, soaking bath. In the next several days you should gradually increase the time and/or distance that you run. For several days (five to ten) you’ll be on a mental high. Somewhere after five to ten days, physically and mentally you may have a bit of a letdown. Keep in mind that time will take care of your doldrums. Make sure that you’re drinking enough water for two or three days after the race. Also, make sure to concentrate on consuming plenty of carbohydrates to replace your glycogen stores. Recovery from an ultra should be very similar to the week before an ultra (in terms of training, eating, and resting). One sure-fire way to get the race behind you is to determine what your next race will be. This will divert your mental energies from the past and direct them towards the future. When you finish your first ultra you’ll feel like you’ve conquered the world. You will want to tell everyone how great you did. There is a tendency to think that you could not have run any faster — wrong. Now that you know you can finish, you can work on improving your time (and you can if you desire). You can’t rest on your laurels — determine other dreams to pursue. • What type of socks are best? Many runners like thick socks. Personally I like very thin socks even in the winter. The best socks that I have found are Thor-Lo Ultra Thin Running Socks. • Should I take aspirins during an ultra? I usually take a couple of aspirins every four to five hours. Does it help? I don’t know — maybe mentally. • Do high energy bars such as PowerBars work? Yes, but most of them are definitely lacking in the area of taste. • Can I drink from springs and streams? I usually don’t hesitate in drinking from a stream at its source. I consider where the stream is and how bad I need a drink as to whether I will drink from a river or creek. I do not purify my water. I don’t think Indians or Pilgrims did either. • Is it bad to have blood in my urine? It is not good. However, it is not real uncommon if you are training hard, especially on tough downhill courses. If it happens to you, start consuming more fluids and slow down your pace on the downhills. • What is wrong with me when I get light-headed or dizzy? You have low blood sugar. You should try to drink as much replacement drink as you can, or Mountain Dew, and cat some food, and slow the pace down and walk for a while. • What should I do if I throw up? Don’t step in it! Eat some crackers and drink some water if you can. If these make you nauseous, don’t eat or drink anything for a while —just don’t quit. I did have problems with nausea until I started eating a lot of Tums/Rolaids. • How should I tie my shoelaces? Loosely. I’ve found that it works best for me to tie my shoes loosely. It prevents pressure on the tendons on the instep, and I think it decreases the chance of turning your ankles. • What should I do if I feel a hot spot or a blister coming? Stop and take care of it with moleskin, second skin, or duct tape immediately.